Tempe Mendoan is a kind of tempeh cooking that is made from thin tempeh, fried with flour so as to taste deliciously piquant. 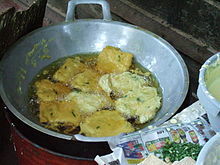 Traditionally in the Banyumas territory, tempe mendoan was made from thin, wide tempeh, one or two sheets cooked at a time. However, tempe mendoan also could be made from normal tempeh that was sliced very thin but wide. Mix well: the two kinds of flour, all ground ingredients, water, and green onion, mix well into a liquid dough. Warm the oil in a frying pan, and put it on the stove until hot. Put each piece of coated tempeh into hot oil. Fry the tempehs, and wait until it becomes hardened and well done. Please don't wait until it becomes yellow and crispy. Take out the tempeh from the warm oil. Let the oil drip from the tempeh so that there is not much oil on it. Served tempeh with soy bean sauce and sliced small chilies. Put together the two kinds of flour and the ground ingredients. Add water little by little until it forms a liquid dough. Mix together until it forms a smooth and complete mix. Add the sliced green onion. Warm the cooking oil in the frying pan. Dip the tempeh into the dough. Insert the tempeh into the hot oil, and fry it until done. Take it out from the oil and serve it with small chilies. This page was last edited on 22 May 2018, at 16:28.